A Few More House Pictures – my books. my life. I don’t have too many pictures for you today, but I didn’t want to leave out this little bit of the house. I’m saving the best – the nursery – for last. So stay tuned. 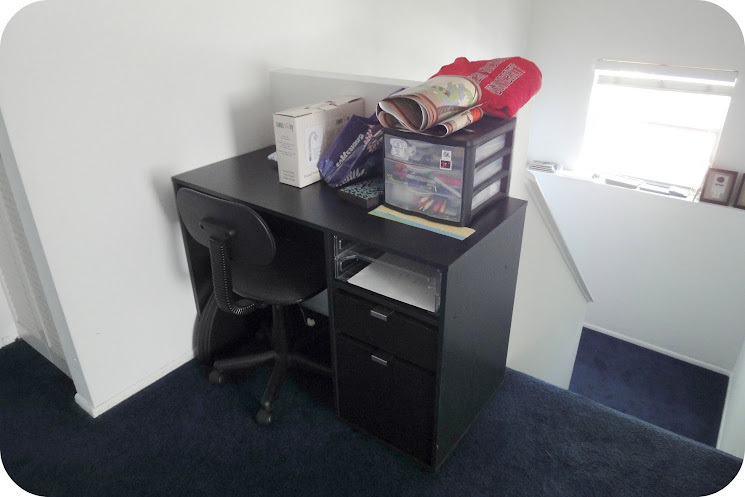 At the top of the stairs, there is a little bit of room, so we thought we’d put a desk there. Then we realized there are no outlets. So it’s pretty much an old fashioned writing desk right now (excuse the little mess). 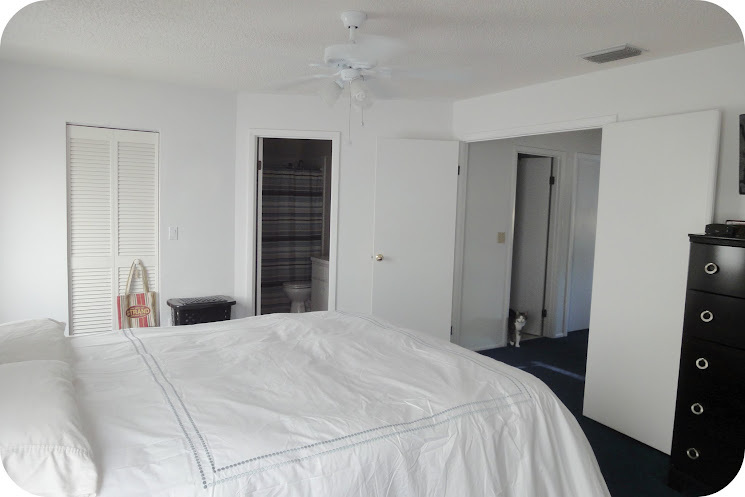 And here is the HUGE master bedroom. Eventually, we’d like to replace this awesome blue carpeting with hardwood or wood laminate floors. When we do that, we’re going to paint the room slate blue and hang some white drapes. Or that’s at least the vision I have in my head. 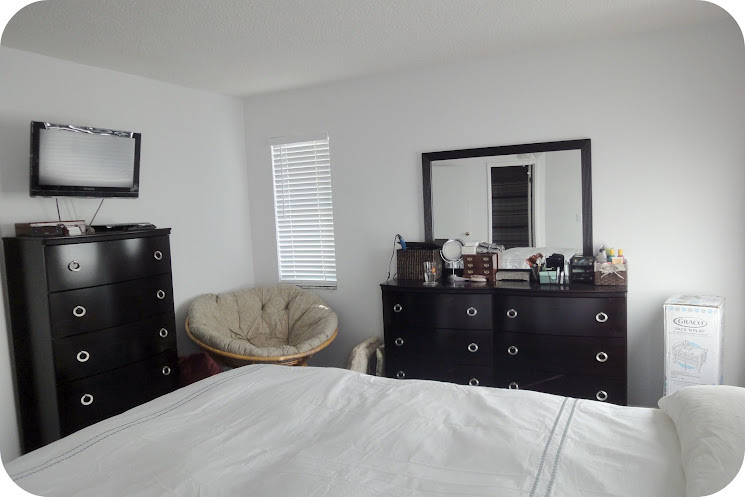 …and my brand new bedroom furniture. We’ve been using hand-me-downs for the last 7 years, and I am psyched to have something of our own finally. I haven’t lived in a two story house for a very long time and it is taking some getting used to. I have to strategically plan to keep from unnecessary stair-climbing, especially with the 30-extra pounds this baby is currently giving me. But if I go past my due date, it might be a good way to induce labor, no? I’m curious. What does your dream bedroom look like? I planned my bedroom for a while before I actually bought my house, and I have to admit, I absolutely love it. I painted the walls a matte Ralph Lauren brown, so it’s dark and feels really luxurious. Plus, it’s really big, so I have a Pier One sofa I got for a steal ($300) opposite my bed and a reading chair. The ceilings are tall, and the wall behind my bed is an oatmeal color, so the whole room isn’t dark. I love love love it. Your new bedroom furniture is really pretty, and I love the duvet. Down comforters are just so comfy. Great space, and I can’t wait to see what you do with it. I recently saw pictures of your bedroom online somewhere, right? If that’s what I’m thinking of, I really liked it. I’m happy with the down (or down alternative really) comforter so far. It’s the kind that’s supposed to keep us cool at night. I love all the space and light you have in your new house! 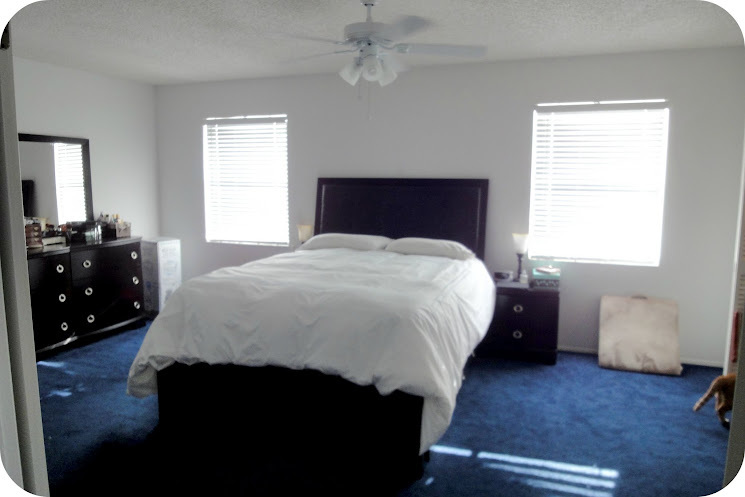 The master bedroom is awesome, and I love the furniture you chose too. If I could design my dream bedroom, it would have a window seat for sure, and a huge and fluffy canopy bed. It would also have a ton of windows overlooking a big backyard. It’s starting to sound like I am designing a new house for myself instead of a bedroom, so I will stop here! I can’t wait to see the baby’s room!